The lyrics come from one of my favorite songs. I’ve played and replayed it so many times this year, it probably deserves its own Spotify playlist. Hearing it always encouraged me and lifted my spirit during stressful times. This song reminded me to take a moment to appreciate the fact that (through the good and the bad) I’m no longer where I started. I’ve taken a journey, where I’ve grown, learned and changed along the way. Now that we’re fast approaching the end of the school year, you might be scrambling to prepare for your finals, writing these last few papers and trying to finalize what’s next for you in terms of summer plans. It’s so easy to forget to enjoy this one big truth: You’ve made it this far! You’re just a few weeks away from finishing your very first year at Ohio State! That is a significant and very special accomplishment and it’s okay to feel proud of yourself. I’m proud of you and I know that our entire Ohio State community is proud of you. You’ve faced all kinds of new difficulties, stresses and hardships this year, from financial, to emotional to physical, but you persevered. That is amazing and you are amazing! It’s also okay if your first year wasn’t absolutely what you imagined it was going to be. All the steps you’ve taken and all the decisions you’ve made up until now have allowed you to get to this point! Whether your first year has been great or on the rough-side, know that you matter. You’re more than your grades and achievements and the fact that you are here is something to be very proud of. If you weren’t certain about your major this year, or if you’re still considering changing majors for next year, this is completely normal. It took me until the beginning of my junior year to find the right major for me, and I couldn’t be happier with the way things have panned out. Keep searching, keep asking questions and keep an open mind! Everything does not have to be decided within your first year. Would you like to become more efficient in managing your time? Be a little less or more involved on campus? Improve your study habits? Consider how this year went as you reflect. Think about how that reflection can possibly turn into goals for next year, for example—making sure to go to the fall involvement fair, reaching out to professors early on and using a planner to keep all your classwork and notes organized. Take a little time to say thank you to those who have helped you during your first year here. That could be a great group of friends, family, roommates, floormates, your RA, a professor, a commuter liaison and more. It’s never corny to write a thank-you note! Showing gratitude goes a long way and it will mean a lot to those who receive it! Think of the summer ahead as an opportunity to rest, rejuvenate and take time for the things that are important to you. No matter where you’re going this summer, or what your plans are–be sure to take some time to relax and enjoy the season! Remember, you made it this far! I hope that in the busyness of this season, you can take some time to really let that sink in and appreciate all that your first year has been. Congratulations and keep going! We believe in you, I believe in you and your fellow Buckeyes believe in you! Reflecting on my first year at Ohio State, I have very little negative things to say about my experience. As a theatre major I added three credits to my resume, and I made it into my second major, journalism. I even finished the year with a 4.0 GPA. I was selected to be in a black male leadership round-table, and I became an FYE Peer Leader. While all of these things appear to be wonderful accomplishments, which they are, they came at a price. These accomplishments were in part fueled by my perfectionism, and eventual fed my perfectionism. Many people when deeming themselves perfectionist the term usually has more of a positive connotation. Perfectionism often breeds hard workers, good work, and often to an extent, good leaders. However, perfectionism can be dangerous to one’s wellbeing. I know personally, I was willing to sacrifice my mental, emotional, and especially my physical health to accomplish my goals. If a job needed to be done it would get done, regardless of what I ate or how much sleep I got. My first semester, I did not care to reach out and meet new friends or even develop close relationships with my roommates. I wanted to be excellent in my work, that is what was important. Indeed, one does come to college to get an education first, but that is not all that matters. I truly believe people cannot be their best selves without considering their overall well being. Eventually this would take a toll on how I felt, and by the time a break approached it would often become very difficult to follow through with my work. However, maintaining greater attention toward my health, rather than my desire for excellence, could have made my first year a much more enjoyable experience. I found this out my second-year. When I began to loosen my obsession on perfection and payed closer attention to my health, I saw things change. I don’t just operate throughout my life. I enjoy my life. I write this to make people aware of the students who work really hard and seem fine but may be on an unhealthy path. If you are reading this or know someone like this, I hope you have the courage to do one of the following actions: reflect on your practices and make changes where you see fit or talk with your friend or student just to make sure they are maintaining a healthy well being. Wellness is just as important, if not more important than excellence. A line from our amazing school song, Carmen Ohio. I have recently been reflecting on my time here at Ohio State. I’m nearing a full two-years & time sure has shown a lot of change. At 18 I came in wanting to be a doctor because I liked the medical field. I would be able to provide for myself and because, c’mon, it sounds great saying that you’re a doctor. However, time showed that despite what I thought, I didn’t have my life figured out quite yet. Full disclosure: I’m a goal-oriented person that loves to have a plan, yet my master plan wasn’t planning out (see what I did there). It was very hard and kind of scary to be in a place where you’re not 100% sure what you want to do with your life. Everyone says “it’s college! It’s the time to make mistakes and not have it all figured out.” Yet I was terrified because I didn’t want to take classes that wouldn’t help me graduate because my financial aid only covers four years. I thought I needed to figure it all out. However, in my reflection upon my almost two full years as a Buckeye, I’m starting to realize it’s okay to not know. A professor of mine recently said, “if you don’t know ask, otherwise it’ll always be confusion.” Yet, sometimes when you ask you still can’t find the answer. In reflecting on what you’ve done so far, you might realize you have the answers to questions from the past. Sometimes the answer is something only your future self can answer because it hasn’t fully panned out yet (and yes, I know I’m sounding a bit like the ending to a classic teen/young adult movie). But in all seriousness, I don’t know what my future holds. And it’s scary to not know when everyone tells you how important this time in your life is. 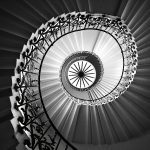 Quoting a great scholar (Lauren A. Nelson, myself lol) everyone’s staircases are different. Some people have fewer steps and some people have 1,000. Some people take years to climb theirs and others are done in a week. My point is to take time to enjoy your ascent up your staircase. You don’t have to know exactly what’s at the next floor, it’s okay to go back down a few steps in order to continue moving up, and it’s okay to be scared. Yet be sure to take a look back because the staircase will definitely show how it’s changed over time. You’d be surprised — steps I thought I’d never climb, I’ve blown past. Sometimes I hop back down a couple steps and have to get back up. But when I graduate, the person I am at the top of my staircase will be because I was brave enough to take the next step, even when I didn’t know what it held. Before we can talk about how to find your purpose at OSU, we have to think about how to find your overall purpose. 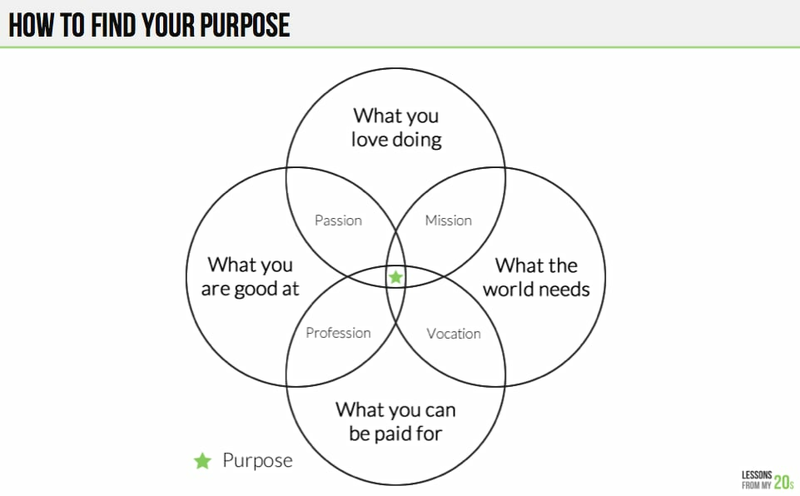 Here is a chart with questions to consider when trying to find your purpose. It is really the balance between all of the above items that can tell you where your purpose lies. Ask yourself what you love doing. This could be a hobby or something you love to think about. A passion can be something that you have to work on, something you have to learn. For me it is social justice. Social justice is more than treating people fairly, it is about understanding social structures and how they oppress people. That is not something that I was born knowing, I had to spend time learning and still have learning to do.Figuring this out is very hard but it is very important and it is worth the struggle. By following your passion and letting that be the main thing that influences your decisions, everything else will fall into place. If you use your passion as your foundation, you will be able to find a profession that you love, a vocation that will never seem too big, and a mission that you will always want to work on. The reason that your passion can impact so much is because it is based in your happiness. When you are doing what makes you happy, everything else falls into place because happiness is the biggest motivator. It is important to keep in mind that, in my opinion, there is no ONE thing that we are meant to do. There are many jobs that I could do that could fulfill my purpose. Finding what you love — the thing that fuels your passion, the thing that you have to incorporate into every part of your life — that is your purpose and can manifest in your life in many different ways. It effects the people you hold close, the activities you do, and it can put you in a career that you love. Basing your actions on your purpose and passions will lead you down a path that introduces you to the best people you will ever meet, the best job you’ve ever had, and the best life that you could think of. The most important thing is to figure out what you love and how to incorporate that into your life. Keeping your major and passion separate could stop you from pursuing something that makes you happy. Figure out how your major fits into it or if there is a major that fits with your passion. Take Action. Once you figure out your passion, get involved in organizations where you can do work in something you love and gain some experience, knowledge, and understanding of what it takes to do work in that field. Always keep what you love in mind. These are some things I have done that led me to find my purpose, and my life is a lot better for it. It will help you understand what you need to work towards and give you the motivation to go far at OSU and in life. Each year we hire an amazing team of Peer Leaders and we would love for you to consider applying to be a part of the family! Check out this awesome video made by our own PL Logan Woodyard (lovingly known as PLogan) which highlights a lot of the memories that the FYE Peer Leaders have created this year. Interested in applying? Applications are due January 31st! Fresh Starts and New Beginnings. New year, new me. Right? Okay okay, so maybe this saying is overused and more of a joke at this point, but let’s talk about what it really means. 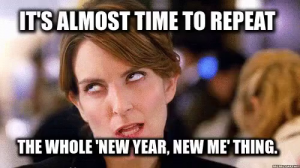 It is so easy for people turn their noses to the idea of a new year’s resolution and regard it as a non-committal way of making yourself feel better without actually changing anything. 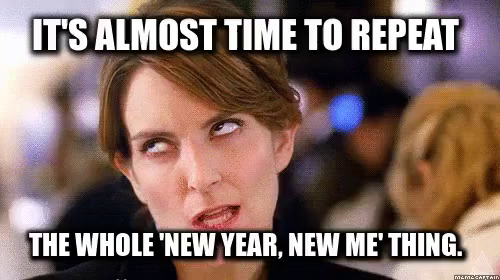 I’m sure you have seen the “new year, new me” jokes on twitter. 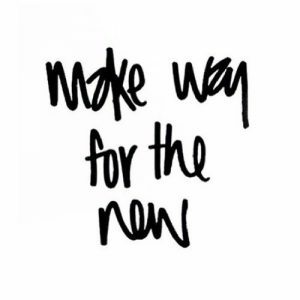 But what is so wrong with wanting a fresh start? If you need a symbolic clean slate to start making those changes in your life that you have always wanted to, then by all means take that clean slate and change! There is no shame in wanting to be the best you that you can be and there is no shame in using the new year to do that. “So how does this apply to the experience of being a first year student?” you may ask. College is a long process of trial and error experiences. As a first year student, I went into my first semester having some grand expectations of what how life was to be, how my academic performance would be, and how my social life was go to play out. Needless to say, I came out of my first semester with the realization that my expectations were incredibly wrong. I am sure many of you know exactly that feeling. Well I am here welcome you back to OSU, and to second semester! There is no better time to take what you have learned about your OSU experience, and build off of that. Don’t like how you studied last semester? 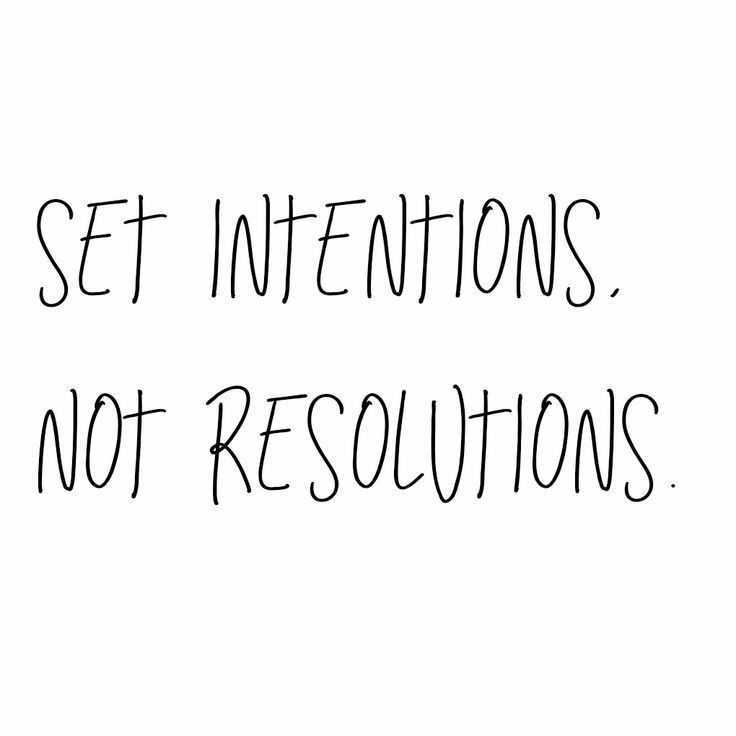 Commit to making that change this year! Found way too much free time on your hands? Commit to joining a student org this year! The possibilities are literally endless. Take what you learned last semester and use this fresh start to grow from it. I encourage you to make those new year’s resolutions and go out there and be that new you. Stay Positive and don’t lose faith. Throughout my first semester I couldn’t shake my negative experiences, which ultimately altered my entire perception of Ohio State. This place just isn’t for me. I am never going to fit in and find friends. For so long I led myself to believe that there was no hope, and I should just transfer before it was too late. It took quite a bit of time, but eventually I made my first friend (shortly after I had convinced myself to give up hope, too), and that was the beginning of the turning point to my Ohio State experience. Keep trying. Don’t give up if you haven’t found your fit. I joined four different student orgs and tried my hardest to make friend in my classes and res hall. Unfortunately for my freshman self, all but one of these resulted in failure, and that one wasn’t even a success until a week or two before finals. Be patient with your transition. Being at Ohio State was such a different experience than anything I had expected or experienced at home. There was so much newness all around me and it made everything significantly harder for me. To add on to that, I was the only one in my friend group to go away for college. As I was trying to get used to all the newness here, I would often turn to my friends back home for support, but they could never quite comprehend just how hard of a transition I was going through. Like I said, they were thriving and loving their new lives. Our lives just weren’t the same anymore. OSU was rapidly changing me and this only made me feel more alone and disconnected, not just here at OSU, but also to the old life I once knew. My first semester was pretty rough, but now, I have the best roommates, friends, and support system I could have ever have hoped for. Ohio State is my favorite place in the world and it’s impossible for me to fathom that one day I’ll have to leave. If you take away anything from this, remember that there are tens of thousands of students on this campus and over 1,300 student organizations on campus; there is a place here for you. You may not find it right away, but you will eventually. Because you belong here. I have lived on a farm my entire life. I come from generations of farmers and a family that hasn’t strayed too far from northwest Ohio until recently and because of that, I have a very different experience than most people. Coming to Ohio State, I realized this very quickly. I was on a floor where only one other person came from a small town/farm/rural area… this one person was my roommate who I went to high school with. Being different than everyone else, I quickly felt left out and like I had missed out on experiences in my life because I didn’t go to a larger public school or have the same experience as everyone else. The feeling of being left out had me homesick for a while. I struggled trying to figure out who to hang out with and what clubs to join. I struggled navigating the bus systems (both COTA and CABS). This then led to me not venturing far from my dorm. I actually rarely left my dorm until a few people from my suite (I lived in good ‘ole Morrill Tower) convinced me to go out to eat with them on a random Friday night. Luckily because of them, I started to venture into campus more.Coming from a small town, I was not used to the idea of a city. I was in shock when I walked onto campus. I came from somewhere where I was literally surrounded by cornfields and bean fields. Campus was a city in and of itself! I then wondered how I would ever figure out Columbus if I couldn’t even figure out campus. Luckily, even though my first semester was difficult and overwhelming, I was convinced to stay another semester. If you are feeling overwhelmed and stressed IT’S OKAY. Second semester I found a few clubs (with the help of my peer leader and advisor) that made me feel at home. Campus started to feel a lot smaller, and I started to feel like I had a bigger place on campus. I was able to navigate my way around both campus and parts of Columbus. If you are feeling overwhelmed, stressed, out of place… Don’t worry. You’re not the only one and it’s okay to feel that way. First semester, I had no idea what could be accomplished in the spring semester, and little did I know I would also find my fit on campus. I am a white Christian in the middle class, and that’s ok. I grew up with little diversity around me. When there was diversity, it wasn’t much of a difference for me. Needless to say, coming to OSU was like going from 0 to 100 miles per hour in my tiny Toyota Camry. My first year was filled with frustration, eye opening experiences, and a whole lot of learning. Why do I celebrate diversity? There are many reasons, but here are three that I can clearly identify: being in such a diverse culture has opened my eyes to struggles and realities I had never noticed, it has made me stronger in my beliefs, and I have developed respect for not only the cultures around me, but my own culture as well! Right away my eyes were opened to the different struggles regarding race and socioeconomic status. My family is not insanely “rich” by any means, but we live comfortably. My parents were blessed and in return they are paying for my college and providing for my needs. In my head I knew that there were people struggling to pay for their own college, but I had not met anyone doing so until I got to OSU. It wasn’t until I truly met people going through financial crises that I realized I should not take my situation for granted. The time they have to spend apply for loans, figuring out grants, working, and even worrying about finances was outstanding to me. If you are from the majority, like me, upper or middle class – don’t take for granted what you have been blessed with. And don’t be greedy with what you have been blessed either. My beliefs as a Christian have been strengthened. Strengthened because I have had the opportunity to talk to so many people of different religions and backgrounds. I have learned A LOT from people about other religions, or simply not having a religion at all. I had to truly question if what I believe is true, and I had to figure out what I believe by researching and reading for myself rather than base what I believe off of what I have been taught growing up. The amazing thing, and what has made me stronger in my faith today, is that I still choose everyday to believe in Jesus Christ despite the new opportunities and ideas presented to me. This has made my faith grow more in the time I have been at OSU than in my whole life. As far as diversity – like I mentioned, I have never experienced true diversity until coming to OSU. I have learned so much from my friends who are different from me. People of a different skin color, culture, sexual orientation, religion, and political beliefs are now my friends. We all have different perspectives and backgrounds, but that is what makes us stronger. There is not one narrow minded way of thinking around OSU – there are multiple perspectives representing everyone, not just people like me. Although we have our differences and disagreements, we are able to work together for a greater cause. In regards to my peer leader role, that greater cause is helping the class of 2021 at OSU. I love my team, I love our differences, and I love that our differences don’t discourage us from what is ultimately important in our lives. Am I ashamed to be apart of the majority perspective? Not at all. There was no way for me to control what has been given to me. Have I learned to celebrate and learn from other cultures – certainly. By doing that, I have deepened my respect for every culture and gained a sense of pride for my own.